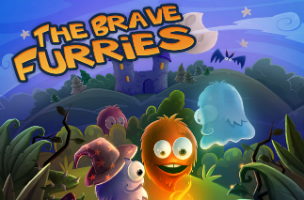 BulkyPix and Crazy Goat Games have launched Brave Furries on iOS and Android devices, challenging players to solve level-based puzzles by moving colorful balls of fur around the screen. In each level, players must cover colored lights with furries of the same color, but there are some important rules to keep in mind along the way. Tapping on a furry causes it to jump as far as it can away from its starting location. However, furries can’t jump over one another, so filling one row or column of lights before filling another may leave gamers with no option but to start over and correct the mistake. That is, if players tap a green furry to cause it to jump to the right, but a red furry is in its way, the level is “blocked” and players must start from scratch, or spend free currency to back up one step at a time until they correct their mistake(s). The more gamers play, the more colors of furries are added to puzzles, and additional obstacles increase the challenge. For instance, an orange furry can be manually placed on the board, to take the place of another furry and open up the solution to a puzzle. In addition, some puzzles may have multiple rounds, or even time limits for completion. If players get really stuck, they can spend premium gems to view a step-by-step solution to the round. These gems are earned in small quantities for free, but can be purchased in bulk with real money. The game’s setting sees users working to rescue the Furry Princess from an evil wizard, so players will find themselves not only completing hundreds of puzzles, but also exploring a dilapidated castle full of magical spells and runes. Brave Furries is available at a launch price of $0.99 on iTunes and Google Play. Its price will eventually increase to $1.99.